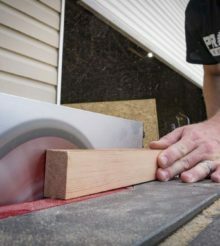 Overall, this tool is successful at saving time on the job and space in your toolbag, but it could use a couple tweaks. If you’re not carrying around a multi-size nut driver, let me make your day: you can combine a bunch of tools and save space in your bag or pouch today! Sounds like an infomercial? Maybe so, but this kind of tool is very convenient for a task so common across the trades. Today, I’ve got the Southwire 6-in-1 Heavy Duty Nut Driver version to review. So go nuts and read on. If the idea of saving space in your tool bag with 1 multi-bit nut driver instead of 5 or 6 individual drivers sounds appealing, give Southwire a shot. Even compared to Klein, this model competes very well. This is a big tool, and it has a bit of weight to it. On the upside, it gives you a great gripping surface, and it still saves space over six individual tools. There’s no tether on this, so you’ll have to be mindful if you’re working overhead. The sockets nest securely yet switch out easily. Hex bolsters accommodate a wrench if you need extra torque, which is a great feature. Unfortunately, the etched size markings are just too small and hard to see. Granted, I don’t have the best vision, but it would be nice if the numbers were bigger. I relied on the color-coding; once I had it memorized, find the right nut size was easy. As nice as it is to have several nut sizes at hand, I don’t quite understand the inclusion of the 3/16-inch. It’s not just the Southwire 6-in-1 Heavy Duty Nut Driver that does this, though. I’ve seen it on other models, too. It makes more sense to me to replace the seldom-used 3/16-inch with an 11/32-inch. That’s usually the nut size needed for when we replace a ballast. Of course, there may be a design challenge there since it replaces the smallest size with one that has to nest in the middle. Still, it’s an adjustment that will set the first one to do it apart from the rest. Klein Tool’s version of the Southwire 6-in-1 Heavy Duty Nut Driver (32800) won a 2016 Pro Tool Innovation Award, and it retails at $23.82. Although they are very similar, I think this Southwire driver has a better grip than Klein’s 6-in-1 version, and it’s priced a touch lower at $22.98. With pricing that close, it may just boil down to your preference between the grips. It’s hard to beat the convenience of the Southwire 6-in-1 Heavy Duty Nut Driver. If the etched size markings were easier to read, and if Southwire swapped the 3/16-inch for an 11/32-inch, this would be the perfect nut driver. Ben Parker has been a Journeyman Electrician since 2015 and has already been in the electrical trade for 7 years. On the job, he enjoys service work and off the job he enjoys golfing, clay pigeon shooting, church, and spending time with his family. I hate how everything Southwire makes is such a blatant rip-off of Klein. Here in Canada they are priced very closely, so you are not saving anything, but you are supporting more Chinese manufacturing, and the fact that Klein created it and they copy it. Hmmm. I’m curious. Is Klein’s version made in the US where the majority of their drivers are actually manufactured or Taiwan? I’m not near my Veto or the shop to look at the moment. And out of loyalty to US where are these Southwire tools actually made? These are awesome and take a beating!